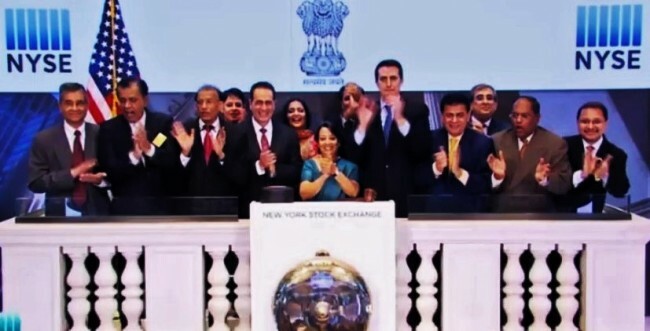 New York, Jan 27 (IANS) The temple of global finance, New York Stock Exchange (NYSE), celebrated Republic Day and Consul General Riva Ganguly Das rang the closing bell for the daily ritual, marking the end of the day’s trading on Thursday. With the President of the exchange, Thomas Farley, standing next to her and Indian and American business and community leaders gathered around them on the balcony overlooking the trading floor, Das brought the day’s trading to a close by banging the gavel after sounding the bell. Thursday was a day of celebration at the exchange because its bellweather index, the Dow Jones Industrial Average (DJIA), held on to and added to the elusive milestone of 20,000, which it had crossed a day earlier in a rally that took off after the election of Donald Trump as the President. The financial world waited with bated breath on Thursday to see if it can hold on to the gains and stay over 20,000 mark. As traders cheered, Dow Jones added 32.40 points for the day to close at 20,100.91 when Das rang the closing bell. The world’s biggest stock exchange, NYSE lists more than 2,400 companies with a market capitalisation of over $19.3 trillion. Eight Indian companies, including Dr Reddy’s Laboratories, Wipro, InfoSys and ICICI, are listed on it. Nine India-oriented exchange traded funds also trade there. Four Indian-Americans honored as "The Pride of America"